Fujitsu America of Sunnyvale, Calif., is recalling about 6,400 battery packs used in Fujitsu notebook computers and workstations sold in the U.S. and Canada. The company has received one report of a battery fire in Canada. This recall involves Panasonic lithium-ion battery packs for these Fujitsu notebook computers and workstations: CELSIUS H720, LIFEBOOK E752, E733, E743, E753, P702, P772, S710, S752, S762, T732, T734, and T902. 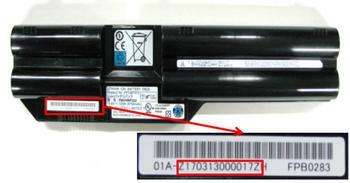 Recalled battery pack product numbers are CP556150-03, CP579060-01 and CP629458-03. The product and serial numbers are printed on a white sticker on the battery. The battery packs, manufactured in China, were sold online at www.shopfujitsu.com from July 2012, through December 2017, for about $170 for the battery pack sold separately, and between $1,100 and $2,900 for the battery packs sold with Fujitsu notebook computers and workstations. Consumers should immediately stop using the recalled battery packs, power off the laptop, remove the battery and follow instructions to obtain a free replacement battery pack. Until a replacement battery pack is received, consumers should use the laptop by plugging in AC power only. Consumers may contact Fujitsu at 800- 835-4878 or 800-8FUJITSU from 7 a.m. to 7 p.m. (CT) Monday through Friday or online at http://www.fujitsu.com/us/support/products/computing/notebooks/battery-recall/2018.html for more information.